Tim Seeley and Juan Ferreyra are a powerhouse combination, one half of the writing team that brought emotional lyricism to Grayson's spy shenanigans and one half of the art team drawing a retro-cool Rebirth Green Arrow like nothing else on the stands. Their New Suicide Squad Vol. 4: Kill Anything is as good as you would expect, a smart take on the Squad both in plot and layouts, a fine end to the New Suicide Squad title with a Quentin Tarantino aesthetic. I'll say at the top, do not read the back of this book, which spoils the story's good twist of the kind Seeley and Tom King were known for on Grayson. My only complaint about Kill Anything is that it is not a Suicide Squad story proper, but rather in large part the book is about the Squad gone rogue and Amanda Waller deciding to come save them. Were Seeley continuing a long run on Suicide Squad (and no offense to Rebirth Squad writer Rob Williams, but I wouldn't mind seeing Seeley take on the Squad again), then a deviation from the norm wouldn't be a problem. Given just one story, however, it's unfortunate we only barely get to see the Squad be the Squad and, in some respects, the "fight club" aspects of this story could have been told with any set of characters, not just the Squad. In broad terms we also have the issue of having just seen a "rogue" Squad of sorts (or at least one briefly un-leashed to kill Waller) in Sean Ryan's New Suicide Squad Vol. 3: Freedom, though that's just unfortunate coincidence. That said, there's unmistakable brilliance to Seeley's five-part Suicide Squad story, in which unbeknownst to the reader almost no one is telling the truth and barely anything "true" is going on in the first issue, and it's not even until almost the end of the second that the real story begins to emerge. That's a fantastic amount of subterfuge, reminiscent of Matt Kindt's Mind MGMT, and especially that Seeley spins two entertaining issues even before he gets to the crux of things behind all the artifice. In Kill Anything, Seeley balances a Grand Guignol with smart character development. As I mentioned, there's shades of Quentin Tarantino, Boondock Saints, and Saw here; not to mention, Seeley and Ferreyra don't go light on the gore (though Ferreyra's painterly spatters are often as pretty as they are horrifying), and they evoke well the claustrophobia of being trapped in a castle with an army of killers. 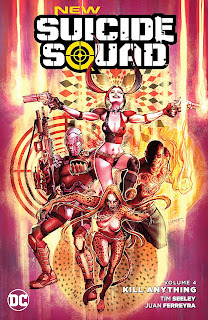 At the same time, Seeley demonstrates very concrete, nuanced ideas of these characters, especially Deadshot -- the capable leader even as he harbors a deathwish -- and Harley Quinn, whom Seeley portrays as crazed and as brilliant as any writer has done in recent memory. Seeley also writes a Deadshot/Harley Quinn friendship I could read forever. Other writers ought take note of these definitive versions of these characters. Ferreyra does no wrong here, with the kind of mature art we should expect from all of DC's books -- not only well-depicted figures, not only clear and dynamic action, but also fantastic small details, like the particular pattern of light through forest trees in the second issue. Seeley and Ferreyra use a number of two-page spreads, but always these include complicated paneling, not splashes, and their use is selective -- in the third issue, specifically for the duration of a Deadshot scene but not for the other characters' scenes elsewhere in the same chapter. It bears even stepping back to admire Ferreyra's covers. Take his New Suicide Squad #17, which has Harley Quinn emerging from a casket that's flying through the air out of the back of a hearse, with the other Squad members emerging elsewhere from the car. Clearly something happened just before this, the pictured gang members sneaking up on the car, the casket popping out, etc., and Ferreyra's cover perfectly captures the apex of the moment while at the same time telling the story. This is equally true of the three parts of his cover to issue #20, which first shows Deadshot reaching up from where he and Harley cling to a ledge, second reveals Captain Boomerang taunting Deadshot by offering the razor edge of his weapon, and third has Waller hanging disapprovingly behind Boomerang. Again, there's lovely storytelling to the cover, unfolding as the reader examines it. (Not to mention Ferreyra's issue #22 cover, which "evolves" left to right and back again as Harley Quinn eventually bashes her own young self with a mallet). The book ends with that aforementioned Harley Quinn issue, written by New Suicide Squad's longest-serving writer Sean Ryan. On one hand Ryan's story is fairly light, a hallucinatory tale that offers no new insights into Harley's generally-accepted origin. On the other hand, the crux of the story (nicely drawn by Ronan Cliquet) is the clincher in the final pages, where Harley's former self offers that she's "trying to figure out ... why you're trapped in a cycle you can't seem to escape. I want to see you free"; Harley replies to a ghostly white light in her cell, "Thanks for nothing." A hallmark of Ryan's run -- my take on New Suicide Squad Vol. 1: Pure Insanity and Monsters especially -- was Ryan writing himself into the character of Vic Sage, trying and failing to wrangle the Suicide Squad characters. Though there's not much to this issue otherwise, it's a fitting end to see Ryan's voice come back a bit, equally trying and failing one more time to get inside the Harley Quinn character. One can certainly enjoy and appreciate New Suicide Squad Vol. 4: Kill Anything without any knowledge of Tim Seeley's Grayson, but I would note there's some related characters here, in a way that makes nice use of the shared universe. Seeley's use of a classic Who's Who-style page for Amanda Waller's villain files is clever, the kind of shout-out to DC lore that Seeley does well. In all one can't do much better than this, and kudos to Seeley, Juan Ferreyra, and Sean Ryan; despite the Suicide Squad's rocky start in the New 52, New Suicide Squad blossomed into something great, and the concept's got a full head of steam going in to Rebirth.